Complete all-atom model of HIV-1 capsid (Nature 497:643, 2013, featured on Nature Cover). Retroviruses, such as human immunodeficiency virus 1 (HIV-1), contain mature conical capsids that enclose the viral RNA genome, enzymes and accessory proteins. The assembly and stability of the viral capsid are critical to the viral replication life cycle. Structures of the building blocks of the assembly were determined to atomic level, the mechanisms of capsid assembly and uncoating, however, remain unclear. Such information is essential for the development of therapeutic drugs that target viral capsid. Furthermore, many host cell defence proteins, including restriction factors Trim5α, TrimCyp and MxB, target the viral capsid at the early stages of infection and potently inhibit virus replication. These restriction factors appear to function through a remarkable capsid pattern sensing ability that specifically recognizes the assembled capsid, but not the individual capsid protein. Using cutting-edage cryoEM/cryoET technologies, we aim to determine the molecular interactions between the viral capsid and host factors that underpin their capsid pattern-sensing capability and ability to inhibit HIV-1 replication. Bacteria use chemotaxis signaling pathways to monitor their environment and respond appropriately to change. The essential core signaling unit comprises transmembrane receptors, a histidine kinase CheA, and a coupling protein CheW. Remarkably, bacteria accomplish the extraordinary gain and cooperativity in chemotaxis signaling by arranging a few hundred core signaling units into higher order arrays localized at the cell pole. We developed a novel in vitro reconstitution system to generate signaling arrays, and succeeded in obtaining the first structure of the array using cryoET and sub-tomogram averaging. In the future, we aim to determine the precise molecular mechanisms of chemotaxis cooperative signaling using high-resolution cryoEM and cryoET in combination with site-directed mutagenesis and computational modeling. Our long-term goal is to develop plausible molecular models, at atomic resolution, for the entire signaling pathway by assembling structural “snapshots” of the signaling states. Driven by biological inquiries, we have contributed significantly to the advancement of novel 3DEM methods and technologies. 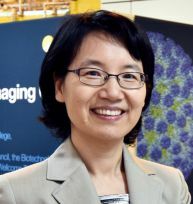 Technology development has been, and continues to be, an integral part of our research, and we are working on a wide spectrum of technical advances that will be essential to realize the promise of imaging molecules in cells and tissues at near-atomic resolutions in situ in their native environment. Macromolecular complexes are intrinsically flexible and often challenging to purify for structure determination by single-particle cryo-electron microscopy (cryo-EM). Such complexes can be studied by cryo-electron tomography (cryo-ET) combined with subtomogram alignment and classification, which in exceptional cases achieves subnanometer resolution, yielding insight into structure-function relationships. However, it remains challenging to apply this approach to specimens that exhibit conformational or compositional heterogeneity or are present in low abundance. To address this, we developed emClarity ( https://github.com/bHimes/emClarity/wiki ), a GPU-accelerated image-processing package featuring an iterative tomographic tilt-series refinement algorithm that uses subtomograms as fiducial markers and a 3D-sampling-function-compensated, multi-scale principal component analysis classification method. We demonstrate that our approach offers substantial improvement in the resolution of maps and in the separation of different functional states of macromolecular complexes compared with current state-of-the-art software. We demonstrate that ion-beam milling of frozen, hydrated protein crystals to thin lamella preserves the crystal lattice to near-atomic resolution. This provides a vehicle for protein structure determination, bridging the crystal size gap between the nanometer scale of conventional electron diffraction and micron scale of synchrotron microfocus beamlines. The demonstration that atomic information can be retained suggests that milling could provide such detail on sections cut from vitrified cells. Dynamin-related proteins (DRPs) are large multidomain GTPases required for diverse membrane-remodeling events. DRPs self-assemble into helical structures, but how these structures are tailored to their cellular targets remains unclear. We demonstrate that the fungal DRP Vps1 primarily localizes to and functions at the endosomal compartment. We present crystal structures of a Vps1 GTPase-bundle signaling element (BSE) fusion in different nucleotide states to capture GTP hydrolysis intermediates and concomitant conformational changes. Using cryoEM, we determined the structure of full-length GMPPCP-bound Vps1. The Vps1 helix is more open and flexible than that of dynamin. This is due to further opening of the BSEs away from the GTPase domains. A novel interface between adjacent GTPase domains forms in Vps1 instead of the contacts between the BSE and adjacent stalks and GTPase domains as seen in dynamin. Disruption of this interface abolishes Vps1 function in vivo. Hence, Vps1 exhibits a unique helical architecture, highlighting structural flexibilities of DRP self-assembly. Cleavage and polyadenylation specificity factor 6 (CPSF6) is a human protein that binds HIV-1 capsid and mediates nuclear transport and integration targeting of HIV-1 preintegration complexes. Truncation of the protein at its C-terminal nuclear-targeting arginine/serine-rich (RS) domain produces a protein, CPSF6-358, that potently inhibits HIV-1 infection by targeting the capsid and inhibiting nuclear entry. To understand the molecular mechanism behind this restriction, the interaction between CPSF6-358 and HIV-1 capsid was characterized using in vitro and in vivo assays. Purified CPSF6-358 protein formed oligomers and bound in vitro-assembled wild-type (WT) capsid protein (CA) tubes, but not CA tubes containing a mutation in the putative binding site of CPSF6. Intriguingly, binding of CPSF6-358 oligomers to WT CA tubes physically disrupted the tubular assemblies into small fragments. Furthermore, fixed- and live-cell imaging showed that stably expressed CPSF6-358 forms cytoplasmic puncta upon WT HIV-1 infection and leads to capsid permeabilization. These events did not occur when the HIV-1 capsid contained a mutation known to prevent CPSF6 binding, nor did they occur in the presence of a small-molecule inhibitor of capsid binding to CPSF6-358. Together, our in vitro biochemical and transmission electron microscopy data and in vivo intracellular imaging results provide the first direct evidence for an oligomeric nature of CPSF6-358 and suggest a plausible mechanism for restriction of HIV-1 infection by CPSF6-358.IMPORTANCE After entry into cells, the HIV-1 capsid, which contains the viral genome, interacts with numerous host cell factors to facilitate crucial events required for replication, including uncoating. One such host cell factor, called CPSF6, is predominantly located in the cell nucleus and interacts with HIV-1 capsid. The interaction between CA and CPSF6 is critical during HIV-1 replication in vivo Truncation of CPSF6 leads to its localization to the cell cytoplasm and inhibition of HIV-1 infection. Here, we determined that truncated CPSF6 protein forms large higher-order complexes that bind directly to HIV-1 capsid, leading to its disruption. Truncated CPSF6 expression in cells leads to premature capsid uncoating that is detrimental to HIV-1 infection. Our study provides the first direct evidence for an oligomeric nature of truncated CPSF6 and insights into the highly regulated process of HIV-1 capsid uncoating. As key functional units in neural circuits, different types of neuronal synapses play distinct roles in brain information processing, learning, and memory. Synaptic abnormalities are believed to underlie various neurological and psychiatric disorders. Here, by combining cryo-electron tomography and cryo-correlative light and electron microscopy, we distinguished intact excitatory and inhibitory synapses of cultured hippocampal neurons, and visualized the in situ 3D organization of synaptic organelles and macromolecules in their native state. Quantitative analyses of >100 synaptic tomograms reveal that excitatory synapses contain a mesh-like postsynaptic density (PSD) with thickness ranging from 20 to 50 nm. In contrast, the PSD in inhibitory synapses assumes a thin sheet-like structure ∼12 nm from the postsynaptic membrane. On the presynaptic side, spherical synaptic vesicles (SVs) of 25-60 nm diameter and discus-shaped ellipsoidal SVs of various sizes coexist in both synaptic types, with more ellipsoidal ones in inhibitory synapses. High-resolution tomograms obtained using a Volta phase plate and electron filtering and counting reveal glutamate receptor-like and GABAA receptor-like structures that interact with putative scaffolding and adhesion molecules, reflecting details of receptor anchoring and PSD organization. These results provide an updated view of the ultrastructure of excitatory and inhibitory synapses, and demonstrate the potential of our approach to gain insight into the organizational principles of cellular architecture underlying distinct synaptic functions.SIGNIFICANCE STATEMENT To understand functional properties of neuronal synapses, it is desirable to analyze their structure at molecular resolution. We have developed an integrative approach combining cryo-electron tomography and correlative fluorescence microscopy to visualize 3D ultrastructural features of intact excitatory and inhibitory synapses in their native state. Our approach shows that inhibitory synapses contain uniform thin sheet-like postsynaptic densities (PSDs), while excitatory synapses contain previously known mesh-like PSDs. We discovered "discus-shaped" ellipsoidal synaptic vesicles, and their distributions along with regular spherical vesicles in synaptic types are characterized. High-resolution tomograms further allowed identification of putative neurotransmitter receptors and their heterogeneous interaction with synaptic scaffolding proteins. The specificity and resolution of our approach enables precise in situ analysis of ultrastructural organization underlying distinct synaptic functions. Recent advances in cryo-electron microscopy (cryoEM) have dramatically improved the resolutions at which vitrified biological specimens can be studied, revealing new structural and mechanistic insights over a broad range of spatial scales. Bolstered by these advances, much effort has been directed toward the development of hybrid modeling methodologies for the construction and refinement of high-fidelity atomistic models from cryoEM data. In this brief review, we will survey the key elements of cryoEM-based hybrid modeling, providing an overview of available computational tools and strategies as well as several recent applications. Human dynamin-like, interferon-induced myxovirus resistance 2 (Mx2 or MxB) is a potent HIV-1 inhibitor. Antiviral activity requires both the amino-terminal region of MxB and protein oligomerization, each of which has eluded structural determination due to difficulties in protein preparation. We report that maltose binding protein-fused, full-length wild-type MxB purifies as oligomers and further self-assembles into helical arrays in physiological salt. Guanosine triphosphate (GTP), but not guanosine diphosphate, binding results in array disassembly, whereas subsequent GTP hydrolysis allows its reformation. Using cryo-electron microscopy (cryoEM), we determined the MxB assembly structure at 4.6 Å resolution, representing the first near-atomic resolution structure in the mammalian dynamin superfamily. The structure revealed previously described and novel MxB assembly interfaces. Mutational analyses demonstrated a critical role for one of the novel interfaces in HIV-1 restriction. The recent resolution revolution in cryo-EM has led to a massive increase in demand for both time on high-end cryo-electron microscopes and access to cryo-electron microscopy expertise. In anticipation of this demand, eBIC was set up at Diamond Light Source in collaboration with Birkbeck College London and the University of Oxford, and funded by the Wellcome Trust, the UK Medical Research Council (MRC) and the Biotechnology and Biological Sciences Research Council (BBSRC) to provide access to high-end equipment through peer review. eBIC is currently in its start-up phase and began by offering time on a single FEI Titan Krios microscope equipped with the latest generation of direct electron detectors from two manufacturers. Here, the current status and modes of access for potential users of eBIC are outlined. In the first year of operation, 222 d of microscope time were delivered to external research groups, with 95 visits in total, of which 53 were from unique groups. The data collected have generated multiple high- to intermediate-resolution structures (2.8-8 Å), ten of which have been published. A second Krios microscope is now in operation, with two more due to come online in 2017. In the next phase of growth of eBIC, in addition to more microscope time, new data-collection strategies and sample-preparation techniques will be made available to external user groups. Finally, all raw data are archived, and a metadata catalogue and automated pipelines for data analysis are being developed. Single particle cryoEM has emerged as a powerful method for structure determination of proteins and complexes, complementing X-ray crystallography and NMR spectroscopy. Yet, for many systems, the resolution of cryoEM density map has been limited to 4-6 Å, which only allows for resolving bulky amino acids side chains, thus hindering accurate model building from the density map. On the other hand, experimental chemical shifts (CS) from solution and solid state MAS NMR spectra provide atomic level data for each amino acid within a molecule or a complex; however, structure determination of large complexes and assemblies based on NMR data alone remains challenging. Here, we present a novel integrated strategy to combine the highly complementary experimental data from cryoEM and NMR computationally by molecular dynamics simulations to derive an atomistic model, which is not attainable by either approach alone. We use the HIV-1 capsid protein (CA) C-terminal domain as well as the large capsid assembly to demonstrate the feasibility of this approach, termed NMR CS-biased cryoEM structure refinement. HIV-1 virions assemble as immature particles containing Gag polyproteins that are processed by the viral protease into individual components, resulting in the formation of mature infectious particles. There are two competing models for the process of forming the mature HIV-1 core: the disassembly and de novo reassembly model and the non-diffusional displacive model. To study the maturation pathway, we simulate HIV-1 maturation in vitro by digesting immature particles and assembled virus-like particles with recombinant HIV-1 protease and monitor the process with biochemical assays and cryoEM structural analysis in parallel. Processing of Gag in vitro is accurate and efficient and results in both soluble capsid protein and conical or tubular capsid assemblies, seemingly converted from immature Gag particles. Computer simulations further reveal probable assembly pathways of HIV-1 capsid formation. Combining the experimental data and computer simulations, our results suggest a sequential combination of both displacive and disassembly/reassembly processes for HIV-1 maturation. Chiral nanoparticle assemblies are an interesting class of materials whose chiroptical properties make them attractive for a variety of applications. Here, C18-(PEPAuM-ox)2 (PEPAuM-ox = AYSSGAPPMoxPPF) is shown to direct the assembly of single-helical gold nanoparticle superstructures that exhibit exceptionally strong chiroptical activity at the plasmon frequency with absolute g-factor values up to 0.04. 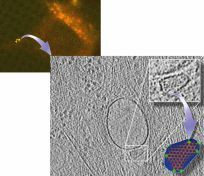 Transmission electron microscopy (TEM) and cryogenic electron tomography (cryo-ET) results indicate that the single helices have a periodic pitch of approximately 100 nm and consist of oblong gold nanoparticles. The morphology and assembled structure of C18-(PEPAuM-ox)2 are studied using TEM, atomic force microscopy (AFM), Fourier transform infrared (FTIR) spectroscopy, circular dichroism (CD) spectroscopy, X-ray diffraction (XRD), and solid-state nuclear magnetic resonance (ssNMR) spectroscopy. 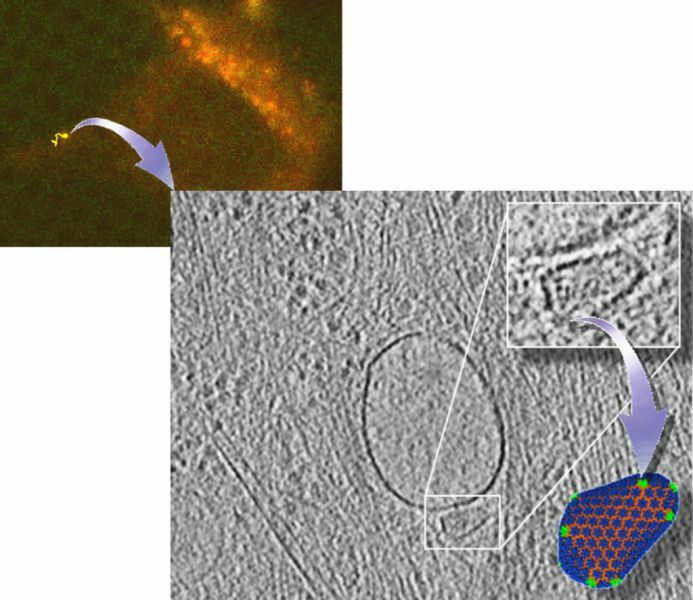 TEM and AFM reveal that C18-(PEPAuM-ox)2 assembles into linear amyloid-like 1D helical ribbons having structural parameters that correlate to those of the single-helical gold nanoparticle superstructures. FTIR, CD, XRD, and ssNMR indicate the presence of cross-β and polyproline II secondary structures. A molecular assembly model is presented that takes into account all experimental observations and that supports the single-helical nanoparticle assembly architecture. This model provides the basis for the design of future nanoparticle assemblies having programmable structures and properties. UNLABELLED: In order to achieve enhanced and synergistic delivery of paclitaxel (PTX), a hydrophobic anticancer agent, two novel prodrug copolymers, POEG15-b-PFTS6 and POEG15-b-PFTS16 composed of hydrophilic poly(oligo(ethylene glycol) methacrylate) (POEG) and hydrophobic farnesylthiosalicylate (FTS, a nontoxic Ras antagonist) blocks, were synthesized. Both POEG-b-PFTS polymers were able to form micelles with intrinsic antitumor activity in vitro and in vivo. Employing these micelles as a carrier to load PTX, their drug loading capacity, stability, in vivo biodistribution and tumor inhibition effect were evaluated. PTX/POEG15-b-PFTS16 mixed micelles exhibited an excellent stability of 9days at 4°C with a PTX loading capacity of 8.2%, which was more effective than PTX/POEG15-b-PFTS6 mixed micelles. In vivo biodistribution data showed that DiR-loaded POEG-b-PFTS micelles were more effectively localized in the tumor than in other organs. Moreover, both PTX/POEG-b-PFTS micelles showed significantly higher antitumor activity than Taxol in a 4T1.2 murine breast tumor model, and the tumor inhibition and animal survival followed the order of PTX/POEG15-b-PFTS16>PTX/POEG15-b-PFTS6>POEG15-b-PFTS16>Taxol≈POEG15-b-PFTS6. Our data suggest that POEG-b-PFTS micelles are a promising anticancer drug carrier that warrants more studies in the future. STATEMENT OF SIGNIFICANCE: Polymerization of drug-based monomer represents a facile and precise method to obtain well-defined polymeric prodrug amphiphiles. Currently, most reports largely focus on the synthesis methods and the biophysical properties. There is limited information about their anti-tumor activity and delivery function as prodrug carriers in vitro and in vivo. In this manuscript, we report the development of two novel prodrug copolymers, POEG15-b-PFTS6 and POEG15-b-PFTS16 composed of hydrophilic poly(oligo(ethylene glycol) methacrylate) (POEG) and hydrophobic farnesylthiosalicylate (FTS, a nontoxic Ras antagonist) blocks. Both POEG-b-PFTS polymers were able to self-assemble into nano-sized micelles with intrinsic antitumor activity in vitro and in vivo. More importantly, POEG-b-PFTS polymers were effective in forming stable mixed micelles with various anticancer agents including PTX, DOX, docetaxel, gefitinib, and imatinib. Delivery of PTX via our new carrier led to significantly improved antitumor activity, suggesting effective PTX/FTS combination therapy. We believe that our study shall be of broad interest to the readers in the fields of biomaterials and drug delivery. Human Cys-loop receptors are important therapeutic targets. High-resolution structures are essential for rational drug design, but only a few are available due to difficulties in obtaining sufficient quantities of protein suitable for structural studies. Although expression of proteins in E. coli offers advantages of high yield, low cost, and fast turnover, this approach has not been thoroughly explored for full-length human Cys-loop receptors because of the conventional wisdom that E. coli lacks the specific chaperones and post-translational modifications potentially required for expression of human Cys-loop receptors. Here we report the successful production of full-length wild type human α7nAChR from E. coli Chemically induced chaperones promote high expression levels of well-folded proteins. The choice of detergents, lipids, and ligands during purification determines the final protein quality. The purified α7nAChR not only forms pentamers as imaged by negative-stain electron microscopy, but also retains pharmacological characteristics of native α7nAChR, including binding to bungarotoxin and positive allosteric modulators specific to α7nAChR. Moreover, the purified α7nAChR injected into Xenopus oocytes can be activated by acetylcholine, choline, and nicotine, inhibited by the channel blockers QX-222 and phencyclidine, and potentiated by the α7nAChR specific modulators PNU-120596 and TQS. The successful generation of functional human α7nAChR from E. coli opens a new avenue for producing mammalian Cys-loop receptors to facilitate structure-based rational drug design. The host cell factor cyclophilin A (CypA) interacts directly with the HIV-1 capsid and regulates viral infectivity. Although the crystal structure of CypA in complex with the N-terminal domain of the HIV-1 capsid protein (CA) has been known for nearly two decades, how CypA interacts with the viral capsid and modulates HIV-1 infectivity remains unclear. We determined the cryoEM structure of CypA in complex with the assembled HIV-1 capsid at 8-Å resolution. The structure exhibits a distinct CypA-binding pattern in which CypA selectively bridges the two CA hexamers along the direction of highest curvature. EM-guided all-atom molecular dynamics simulations and solid-state NMR further reveal that the CypA-binding pattern is achieved by single-CypA molecules simultaneously interacting with two CA subunits, in different hexamers, through a previously uncharacterized non-canonical interface. These results provide new insights into how CypA stabilizes the HIV-1 capsid and is recruited to facilitate HIV-1 infection. Chemotactic responses in bacteria require large, highly ordered arrays of sensory proteins to mediate the signal transduction that ultimately controls cell motility. A mechanistic understanding of the molecular events underlying signaling, however, has been hampered by the lack of a high-resolution structural description of the extended array. Here, we report a novel reconstitution of the array, involving the receptor signaling domain, histidine kinase CheA, and adaptor protein CheW, as well as a density map of the core-signaling unit at 11.3 Å resolution, obtained by cryo-electron tomography and sub-tomogram averaging. Extracting key structural constraints from our density map, we computationally construct and refine an atomic model of the core array structure, exposing novel interfaces between the component proteins. Using all-atom molecular dynamics simulations, we further reveal a distinctive conformational change in CheA. Mutagenesis and chemical cross-linking experiments confirm the importance of the conformational dynamics of CheA for chemotactic function. Camptothecin (CPT) is a potent antitumor agent and functions via inhibiting the activity of topoisomerase I during DNA replication. However, the clinical application of CPT has been greatly hindered by its extremely poor solubility, the instability of its active lactone ring in blood stream, as well as the non-specific toxicity to normal tissues. In addition, most of the formulations developed so far are not applicable for formulating CPT. In this study, two novel CPT prodrugs were developed by conjugating CPT to α-tocopherol via a carbonate ester bond (CPT-VE) or disulfide linkage (CPT-S-S-VE). Both CPT prodrugs were able to self-assemble into nanofibers with the facilitation of a PEG5K-Fmoc-VE2-based nanomicellar carrier. Both prodrug nanoassemblies exhibited excellent stability. Fluorescence quenching, UV absorbance, and FT-IR studies demonstrated strong interactions between carrier and prodrugs, including hydrophobic interaction, π-π stacking, as well as hydrogen bonding. NMR studies suggested that prodrugs were successfully incorporated into PEG5K-Fmoc-VE2 during self-assembly process. In vitro, PEG5K-Fmoc-VE2/CPT-S-S-VE presented significantly higher level of cytotoxicity on tumor cells compared to PEG5K-Fmoc-VE2/CPT-VE. Biodistribution study showed that CPT-S-S-VE formulated in PEG5K-Fmoc-VE2 micelles was effectively converted to parent CPT following delivery to tumor tissues. Finally, PEG5K-Fmoc-VE2/CPT-S-S-VE nanofibers showed superior tumor growth inhibition in an aggressive murine breast cancer model (4T1.2). The high optical and chemical activity of nanoparticles (NPs) signifies the possibility of converting the spin angular momenta of photons into structural changes in matter. Here, we demonstrate that illumination of dispersions of racemic CdTe NPs with right- (left-)handed circularly polarized light (CPL) induces the formation of right- (left-)handed twisted nanoribbons with an enantiomeric excess exceeding 30%, which is ∼10 times higher than that of typical CPL-induced reactions. Linearly polarized light or dark conditions led instead to straight nanoribbons. CPL 'templating' of NP assemblies is based on the enantio-selective photoactivation of chiral NPs and clusters, followed by their photooxidation and self-assembly into nanoribbons with specific helicity as a result of chirality-sensitive interactions between the NPs. The ability of NPs to retain the polarization information of incident photons should open pathways for the synthesis of chiral photonic materials and allow a better understanding of the origins of biomolecular homochirality. Cryo-electron tomography (cryoET) has become a powerful tool for direct visualization of 3D structures of native biological specimens at molecular resolution, but its application is limited to thin specimens (<300 nm). Recently, vitreous sectioning and cryoFIB milling technologies were developed to physically reduce the specimen thickness; however, cryoET analysis of membrane protein complexes within native cell membranes remains a great challenge. Here, we use phage ΦX174 lysis gene E to rapidly produce native, intact, bacterial cell membranes for high resolution cryoET. We characterized E gene-induced cell lysis using FIB/SEM and cryoEM and showed that the bacteria cytoplasm was largely depleted through spot lesion, producing ghosts with the cell membranes intact. We further demonstrated the utility of E-gene-induced lysis for cryoET using the bacterial chemotaxis receptor signaling complex array. The described method should have a broad application for structural and functional studies of native, intact cell membranes and membrane protein complexes. The membrane-anchored atlastin GTPase couples nucleotide hydrolysis to the catalysis of homotypic membrane fusion to form a branched endoplasmic reticulum network. Trans dimerization between atlastins anchored in opposing membranes, accompanied by a cross-over conformational change, is thought to draw the membranes together for fusion. Previous studies on the conformational coupling of atlastin to its GTP hydrolysis cycle have been carried out largely on atlastins lacking a membrane anchor. Consequently, whether fusion involves a discrete tethering step and, if so, the potential role of GTP hydrolysis and cross-over in tethering remain unknown. In this study, we used membrane-anchored atlastins in assays that separate tethering from fusion to dissect the requirements for each. We found that tethering depended on GTP hydrolysis, but, unlike fusion, it did not depend on cross-over. Thus GTP hydrolysis initiates stable head-domain contact in trans to tether opposing membranes, whereas cross-over formation plays a more pivotal role in powering the lipid rearrangements for fusion. The myxovirus resistance (Mx) proteins are interferon-induced dynamin GTPases that can inhibit a variety of viruses. Recently, MxB, but not MxA, was shown to restrict HIV-1 by an unknown mechanism that likely occurs in close proximity to the host cell nucleus and involves the viral capsid. Here, we present the crystal structure of MxB and reveal determinants involved in HIV-1 restriction. MxB adopts an extended antiparallel dimer and dimerization, but not higher-ordered oligomerization, is critical for restriction. Although MxB is structurally similar to MxA, the orientation of individual domains differs between MxA and MxB, and their antiviral functions rely on separate determinants, indicating distinct mechanisms for virus inhibition. Additionally, MxB directly binds the HIV-1 capsid, and this interaction depends on dimerization and the N terminus of MxB as well as the assembled capsid lattice. These insights establish a framework for understanding the mechanism by which MxB restricts HIV-1. Correlative fluorescence and electron microscopy (CFEM) is a multimodal technique that combines dynamic and localization information from fluorescence methods with ultrastructural data from electron microscopy, to give new information about how cellular components change relative to the spatiotemporal dynamics within their environment. In this review, we will discuss some of the basic techniques and tools of the trade for utilizing this attractive research method, which is becoming a very powerful tool for biology labs. The information obtained from correlative methods has proven to be invaluable in creating consensus between the two types of microscopy, extending the capability of each, and cutting the time and expense associated with using each method separately for comparative analysis. The realization of the advantages of these methods in cell biology has led to rapid improvement in the protocols and has ushered in a new generation of instruments to reach the next level of correlation--integration. Self-assembly of proteins and inorganic nanoparticles into terminal assemblies makes possible a large family of uniformly sized hybrid colloids. These particles can be compared in terms of utility, versatility and multifunctionality to other known types of terminal assemblies. They are simple to make and offer theoretical tools for designing their structure and function. To demonstrate such assemblies, we combine cadmium telluride nanoparticles with cytochrome C protein and observe spontaneous formation of spherical supraparticles with a narrow size distribution. Such self-limiting behaviour originates from the competition between electrostatic repulsion and non-covalent attractive interactions. Experimental variation of supraparticle diameters for several assembly conditions matches predictions obtained in simulations. Similar to micelles, supraparticles can incorporate other biological components as exemplified by incorporation of nitrate reductase. Tight packing of nanoscale components enables effective charge and exciton transport in supraparticles and bionic combination of properties as demonstrated by enzymatic nitrate reduction initiated by light absorption in the nanoparticle. We report the size-controlled self-assembly of polymersomes through the cooperative self-assembly of nanoparticles and amphiphilic polymers. 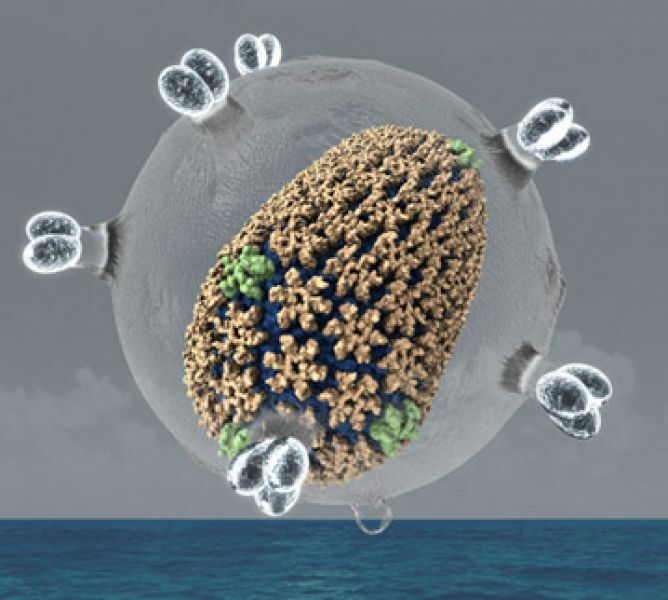 Polymersomes densely packed with magnetic nanoparticles in the polymersome membrane (magneto-polymersome) were fabricated with a series of different sized iron oxide nanoparticles. The distribution of nanoparticles in a polymersome membrane was size-dependent; while small nanoparticles were dispersed in a polymer bilayer, large particles formed a well-ordered superstructure at the interface between the inner and outer layer of a bilayer membrane. The yield of magneto-polymersomes increased with increasing the diameter of incorporated nanoparticles. Moreover, the size of the polymersomes was effectively controlled by varying the size of incorporated nanoparticles. This size-dependent self-assembly was attributed to the polymer chain entropy effect and the size-dependent localization of nanoparticles in polymersome bilayers. The transverse relaxation rates (r2) of magneto-polymersomes increased with increasing the nanoparticle diameter and decreasing the size of polymersomes, reaching 555 ± 24 s(-1) mM(-1) for 241 ± 16 nm polymersomes, which is the highest value reported to date for superparamagnetic iron oxide nanoparticles. After virus fusion with a target cell, the viral core is released into the host cell cytoplasm and undergoes a controlled disassembly process, termed uncoating, before or as reverse transcription takes place. The cellular protein TRIM5α is a host cell restriction factor that blocks HIV-1 infection in rhesus macaque cells by targeting the viral capsid and inducing premature uncoating. The molecular mechanism of the interaction between capsid and TRIM5α remains unclear. Here, we describe an approach that utilizes cryo-electron microscopy (cryoEM) to examine the structural changes exerted on HIV-1 capsid (CA) assembly by TRIM5α binding. The TRIM5α interaction sites on CA assembly were further dissected by combining cryoEM with pair-wise cysteine mutations that crosslink CA either within a CA hexamer or between CA hexamers. Based on the structural information from cryoEM and crosslinking results from in vitro CA assemblies and purified intact HIV-1 cores, we demonstrate that direct binding of TRIM5α CC-SPRY domains to the viral capsid results in disruption and fragmentation of the surface lattice of HIV-1 capsid, specifically at inter-hexamer interfaces. The method described here can be easily adopted to study other important interactions in multi-protein complexes. Cryo-electron tomography (cryoET) allows 3D visualization of cellular structures at molecular resolution in a close-to-physiological state(1). However, direct visualization of individual viral complexes in their host cellular environment with cryoET is challenging(2), due to the infrequent and dynamic nature of viral entry, particularly in the case of HIV-1. While time-lapse live-cell imaging has yielded a great deal of information about many aspects of the life cycle of HIV-1(3-7), the resolution afforded by live-cell microscopy is limited (~200 nm). Our work was aimed at developing a correlation method that permits direct visualization of early events of HIV-1 infection by combining live-cell fluorescent light microscopy, cryo-fluorescent microscopy, and cryoET. In this manner, live-cell and cryo-fluorescent signals can be used to accurately guide the sampling in cryoET. Furthermore, structural information obtained from cryoET can be complemented with the dynamic functional data gained through live-cell imaging of fluorescent labeled target. In this video article, we provide detailed methods and protocols for structural investigation of HIV-1 and host-cell interactions using 3D correlative high-speed live-cell imaging and high-resolution cryoET structural analysis. HeLa cells infected with HIV-1 particles were characterized first by confocal live-cell microscopy, and the region containing the same viral particle was then analyzed by cryo-electron tomography for 3D structural details. The correlation between two sets of imaging data, optical imaging and electron imaging, was achieved using a home-built cryo-fluorescence light microscopy stage. The approach detailed here will be valuable, not only for study of virus-host cell interactions, but also for broader applications in cell biology, such as cell signaling, membrane receptor trafficking, and many other dynamic cellular processes. Glycine receptors play a major role in mediating fast inhibitory neurotransmission in the spinal cord and brain stem, yet their high-resolution structures remain unsolved. We determined open-channel structures of the full-length transmembrane domain (TMD) of the human glycine receptor α1-subunit (hGlyR-α1) using nuclear magnetic resonance (NMR) spectroscopy and electron micrographs. hGlyR-α1 TMD spontaneously forms pentameric Cl(-)-conducting channels, with structures sharing overall topology observed in crystal structures of homologous bacterial and nematode pentameric ligand-gated ion channels (pLGICs). However, the mammalian hGlyR-α1 structures present several distinctive features, including a shorter, pore-lining TM2 helix with helical unwinding near the C-terminal end, a TM3 helical kink at A288 that partially overlaps with the homologous ivermectin-binding site in GluCl, and a highly dynamic segment between S267(15') of TM2 and A288 that likely affects allosteric modulations of channel function. Our structures provide additional templates for identifying potential drug targets in GlyRs and other mammalian pLGICs. The biological processes occurring in a cell are complex and dynamic, and to achieve a comprehensive understanding of the molecular mechanisms underlying these processes, both temporal and spatial information is required. While cryo-electron tomography (cryoET) provides three-dimensional (3D) still pictures of near-native state cells and organelles at molecular resolution, fluorescence light microscopy (fLM) offers movies of dynamic cellular processes in living cells. Combining and integrating these two commonly used imaging modalities (termed correlative microscopy) provides a powerful means to not only expand the imaging scale and resolution but also to complement the dynamic information available from optical microscopy with the molecular-level, 3D ultrastructure detail provided by cryoET. As such, a correlative approach performed on a given specimen can provide high resolution snapshots of dynamic cellular events. In this article, I review recent advances in correlative light microscopy and cryoET and discuss major findings made available by applying this method. 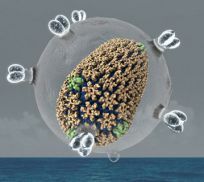 One- or two-dimensional arrays of iron oxide nanoparticles were formed in colloidal assemblies of amphiphilic polymers. Electron tomography imaging revealed that nanoparticles are arranged into one-dimensional strings in magneto-micelles or two-dimensional sheets in magneto-core/shell assemblies. The distinct directional assembly behavior was attributed to the interparticle interaction relative to the nanoparticle-polymer interaction, which was modulated by varying the cosolvent used for the solution phase self-assembly. Magneto-core/shell assemblies with varying structural parameters were formed with a range of different sized as-synthesized nanoparticles. The transverse magnetic relaxivity rates (r2) of a series of different assemblies were determined to examine the effect of nanoparticle arrangement on the magnetic relaxivity for their potential applications in MRI. The results indicated that the assembly structure of nanoparticles in polymer micelles significantly affects the r2 of surrounding water, providing a way to control magnetic relaxivity. We utilize a peptide-based methodology to prepare a diverse collection of double-helical gold nanoparticle superstructures having controllable handedness and structural metrics. These materials exhibit well-defined circular dichroism signatures at visible wavelengths owing to the collective dipole-dipole interactions between the nanoparticles. We couple theory and experiment to show how tuning the metrics and structure of the helices results in predictable and tailorable chirooptical properties. Finally, we experimentally and theoretically demonstrate that the intensity, position, and nature of the chirooptical activity can be carefully adjusted via silver overgrowth. These studies illustrate the utility of peptide-based nanoparticle assembly platforms for designing and preparing complex plasmonic materials with tailorable optical properties. PURPOSE: To develop spherulite formulations to achieve high entrapment efficiency for both small and macromolecules as well as cell-type specific delivery. METHODS: Spherulites of various compositions were prepared, and lipid-PEG was incorporated through post-insertion. Calcein and FITC-labeled albumin were employed as model drugs for small and macromolecules. The spherulites were characterized with respect to entrapment efficiency, size, structure, and release kinetics, and the morphology was examined via cryo-EM. Finally, SV119-decorated spherulites were examined for their selective uptake by cancer cells. RESULTS: The spherulites are 170 ~ 290 nm in size. A loading efficiency of 55 ~ 60% can be consistently achieved for both calcein and albumin under optimized conditions. Cryo-EM shows the onion-like morphology consistent with the structure of multilamellar liposomes. A t(½) of 39.3 h and 69.7 h in cargo release in serum was observed before and after PEG decoration, and incorporation of SV119 led to selective delivery of rhodamine-labeled spherulites to PC-3 tumor cells. CONCLUSIONS: Our optimized formulations may represent a platform with simple preparation approach, relatively small particle size, high drug loading efficiency for both low and high molecular weight agents, and slow release kinetics for selective delivery of various types of therapeutics to target cells. Retroviral capsid proteins are conserved structurally but assemble into different morphologies. The mature human immunodeficiency virus-1 (HIV-1) capsid is best described by a 'fullerene cone' model, in which hexamers of the capsid protein are linked to form a hexagonal surface lattice that is closed by incorporating 12 capsid-protein pentamers. HIV-1 capsid protein contains an amino-terminal domain (NTD) comprising seven α-helices and a β-hairpin, a carboxy-terminal domain (CTD) comprising four α-helices, and a flexible linker with a 310-helix connecting the two structural domains. Structures of the capsid-protein assembly units have been determined by X-ray crystallography; however, structural information regarding the assembled capsid and the contacts between the assembly units is incomplete. Here we report the cryo-electron microscopy structure of a tubular HIV-1 capsid-protein assembly at 8 Å resolution and the three-dimensional structure of a native HIV-1 core by cryo-electron tomography. The structure of the tubular assembly shows, at the three-fold interface, a three-helix bundle with critical hydrophobic interactions. Mutagenesis studies confirm that hydrophobic residues in the centre of the three-helix bundle are crucial for capsid assembly and stability, and for viral infectivity. The cryo-electron-microscopy structures enable modelling by large-scale molecular dynamics simulation, resulting in all-atom models for the hexamer-of-hexamer and pentamer-of-hexamer elements as well as for the entire capsid. Incorporation of pentamers results in closer trimer contacts and induces acute surface curvature. The complete atomic HIV-1 capsid model provides a platform for further studies of capsid function and for targeted pharmacological intervention. PEGylated lipopeptide surfactants carrying drug-interactive motifs specific for a peptide-nitroxide antioxidant, JP4-039, were designed and constructed to facilitate the solubilization of this drug candidate as micelles and emulsion nanoparticles. A simple screening process based on the ability that prevents the formation of crystals of JP4-039 in aqueous solution was used to identify agents that have potential drug-interactive activities. Several protected lysine derivatives possessing this activity were identified, of which α-Fmoc-ε-t-Boc lysine is the most potent, followed by α-Cbz- and α-iso-butyloxycarbonyl-ε-t-Boc-lysine. Using a polymer-supported liquid-phase synthesis approach, a series of synthetic lipopeptide surfactants with PEG headgroup, varied numbers and geometries of α-Fmoc or α-Cbz-lysyl groups located at interfacial region as the drug-interactive domains, and oleoyl chains as the hydrophobic tails were synthesized. All α-Fmoc-lysyl-containing lipopeptide surfactants were able to solubilize JP4-039 as micelles, with enhanced solubilizing activity for surfactants with increased numbers of α-Fmoc groups. The PEGylated lipopeptide surfactants with α-Fmoc-lysyl groups alone tend to form filamentous or wormlike micelles. The presence of JP4-039 transformed α-Fmoc-containing filamentous micelles into dots and barlike mixed micelles with substantially reduced sizes. Fluorescence quenching and NMR studies revealed that the drug and surfactant molecules were in close proximity in the complex. JP4-039-loaded emulsion carrying α-Cbz-containing surfactants demonstrated enhanced stability over drug-loaded emulsion without lipopeptide surfactants. JP4-039 emulsion showed a significant mitigation effect on mice exposed to a lethal dose of radiation. PEGylated lipopeptides with an interfacially located drug-interactive domain are therefore tailor-designed formulation materials potentially useful for drug development. Mycobacteria are shaped by a thick envelope made of an array of uniquely structured lipids and polysaccharides. However, the spatial organization of these molecules remains unclear. Here, we show that exposure to an esterase from Mycobacterium smegmatis (Msmeg_1529), hydrolyzing the ester linkage of trehalose dimycolate in vitro, triggers rapid and efficient lysis of Mycobacterium tuberculosis, Mycobacterium bovis BCG, and Mycobacterium marinum. Exposure to the esterase immediately releases free mycolic acids, while concomitantly depleting trehalose mycolates. Moreover, lysis could be competitively inhibited by an excess of purified trehalose dimycolate and was abolished by a S124A mutation affecting the catalytic activity of the esterase. These findings are consistent with an indispensable structural role of trehalose mycolates in the architectural design of the exposed surface of the mycobacterial envelope. Importantly, we also demonstrate that the esterase-mediated rapid lysis of M. tuberculosis significantly improves its detection in paucibacillary samples. Helical structures are important in many different life forms and are well-suited for structural studies by cryo-EM. A unique feature of helical objects is that a single projection image contains all the views needed to perform a three-dimensional (3D) crystallographic reconstruction. Here, we use HIV-1 capsid assemblies to illustrate the detailed approaches to obtain 3D density maps from helical objects. Mature HIV-1 particles contain a conical- or tubular-shaped capsid that encloses the viral RNA genome and performs essential functions in the virus life cycle. The capsid is composed of capsid protein (CA) oligomers which are helically arranged on the surface. The N-terminal domain (NTD) of CA is connected to its C-terminal domain (CTD) through a flexible hinge. Structural analysis of two- and three-dimensional crystals provided molecular models of the capsid protein (CA) and its oligomer forms. We determined the 3D density map of helically assembled HIV-1 CA hexamers at 16 Å resolution using an iterative helical real-space reconstruction method. Docking of atomic models of CA-NTD and CA-CTD dimer into the electron density map indicated that the CTD dimer interface is retained in the assembled CA. Furthermore, molecular docking revealed an additional, novel CTD trimer interface. Tripartite motif protein isoform 5 alpha (TRIM5α) is a potent antiviral protein that restricts infection by HIV-1 and other retroviruses. TRIM5α recognizes the lattice of the retrovirus capsid through its B30.2 (PRY/SPRY) domain in a species-specific manner. Upon binding, TRIM5α induces premature disassembly of the viral capsid and activates the downstream innate immune response. We have determined the crystal structure of the rhesus TRIM5α PRY/SPRY domain that reveals essential features for capsid binding. Combined cryo-electron microscopy and biochemical data show that the monomeric rhesus TRIM5α PRY/SPRY, but not the human TRIM5α PRY/SPRY, can bind to HIV-1 capsid protein assemblies without causing disruption of the capsid. This suggests that the PRY/SPRY domain alone constitutes an important pattern-sensing component of TRIM5α that is capable of interacting with viral capsids of different curvatures. Our results provide molecular insights into the mechanisms of TRIM5α-mediated retroviral restriction. Cryo-electron tomography (cryo-ET) has enabled high resolution three-dimensional(3D) structural analysis of virus and host cell interactions and many cell signaling events; these studies, however, have largely been limited to very thin, peripheral regions of eukaryotic cells or to small prokaryotic cells. Recent efforts to make thin, vitreous sections using cryo-ultramicrotomy have been successful, however,this method is technically very challenging and with many artifacts. Here, we report a simple and robust method for creating in situ, frozen-hydrated cell lamellas using a focused ion beam at cryogenic temperature (cryo-FIB), allowing access to any interior cellular regions of interest. We demonstrate the utility of cryo-FIB with high resolution 3D cellular structures from both bacterial cells and large mammalian cells. The method will not only facilitate high-throughput 3D structural analysis of biological specimens, but is also broadly applicable to sample preparation of thin films and surface materials without the need for FIB "lift-out". Focused ion beam milling at cryogenic temperatures (cryo-FIB) is a valuable tool that can be used to thin vitreous biological specimens for subsequent imaging and analysis by cryo-transmission electron microscopy (cryo-TEM) in a frozen-hydrated state. This technique offers the potential benefit of eliminating the mechanical artefacts that are typically found with cryo-ultramicrotomy. However, due to the additional complexity in transferring samples in and out of the FIB, contamination and devitrification of the amorphous ice is commonly encountered. To address these problems, we have designed a sample cryo-shuttle that directly and specifically accepts Polara TEM cartridges to simplify the transfer process between FIB and TEM. We optimized several parameters in the cryo-FIB and cryo-TEM processes using the quality of the samples' ice as an indicator and demonstrated high-quality milling with large mammalian cells. By comparing the results from HeLa cells to those from Escherichia coli cells, we discuss some of the artefacts and challenges we have encountered using this technique. During retrovirus particle maturation, the assembled Gag polyprotein is cleaved by the viral protease into matrix (MA), capsid (CA), and nucleocapsid (NC) proteins. To form the mature viral capsid, CA rearranges, resulting in a lattice composed of hexameric and pentameric CA units. Recent structural studies of assembled HIV-1 CA revealed several inter-subunit interfaces in the capsid lattice, including a three-fold interhexamer interface that is critical for proper capsid stability. Although a general architecture of immature particles has been provided by cryo-electron tomographic studies, the structural details of the immature particle and the maturation pathway remain unknown. Here, we used cryo-electron microscopy (cryoEM) to determine the structure of tubular assemblies of the HIV-1 CA-SP1-NC protein. Relative to the mature assembled CA structure, we observed a marked conformational difference in the position of the CA-CTD relative to the NTD in the CA-SP1-NC assembly, involving the flexible hinge connecting the two domains. This difference was verified via engineered disulfide crosslinking, revealing that inter-hexamer contacts, in particular those at the pseudo three-fold axis, are altered in the CA-SP1-NC assemblies compared to the CA assemblies. Results from crosslinking analyses of mature and immature HIV-1 particles containing the same Cys substitutions in the Gag protein are consistent with these findings. We further show that cleavage of preassembled CA-SP1-NC by HIV-1 protease in vitro leads to release of SP1 and NC without disassembly of the lattice. Collectively, our results indicate that the proteolytic cleavage of Gag leads to a structural reorganization of the polypeptide and creates the three-fold interhexamer interface, important for the formation of infectious HIV-1 particles. Endoplasmic reticulum (ER) network branching requires homotypic tethering and fusion of tubules mediated by the atlastin (ATL) guanosine triphosphatase (GTPase). Recent structural studies on the ATL soluble domain reveal two dimeric conformers proposed to correspond to a tethered prefusion state and a postfusion state. How the prefusion conformer transitions to the postfusion conformer is unknown. In this paper, we identify an intramolecular salt bridge mediated by two residues outside the GTPase domain near the point of rotation that converts the prefusion dimer to the postfusion state. Charge reversal of either residue blocked ER network branching, whereas a compensatory charge reversal to reestablish electrostatic attraction restored function. In vitro assays using the soluble domain revealed that the salt bridge was dispensable for GTP binding and hydrolysis but was required for forming the postfusion dimer. Unexpectedly, the postfusion conformation of the soluble domain was achieved when bound to the nonhydrolyzable GTP analogue guanosine 5'-[β,γ-imido]triphosphate, suggesting that nucleotide hydrolysis might not be required for the prefusion to postfusion conformational change. Cryo-electron tomography (cryoET) allows 3D visualization of cellular structures at molecular resolution in a close-to-native state and therefore has the potential to help elucidate early events of HIV-1 infection in host cells. However, structural details of infecting HIV-1 have not been observed, due to technological challenges in working with rare and dynamic HIV-1 particles in human cells. Here, we report structural analysis of HIV-1 and host-cell interactions by means of a correlative high-speed 3D live-cell-imaging and cryoET method. Using this method, we showed under near-native conditions that intact hyperstable mutant HIV-1 cores are released into the cytoplasm of host cells. We further obtained direct evidence to suggest that a hyperstable mutant capsid, E45A, showed delayed capsid disassembly compared to the wild-type capsid. Together, these results demonstrate the advantages of our correlative live-cell and cryoET approach for imaging dynamic processes, such as viral infection. Cryo-electron microscopy (cryo-EM), combined with image processing, is an increasingly powerful tool for structure determination of macromolecular protein complexes and assemblies. In fact, single particle electron microscopy and two-dimensional (2D) electron crystallography have become relatively routine methodologies and a large number of structures have been solved using these methods. At the same time, image processing and three-dimensional (3D) reconstruction of helical objects has rapidly developed, especially, the iterative helical real-space reconstruction (IHRSR) method, which uses single particle analysis tools in conjunction with helical symmetry. Many biological entities function in filamentous or helical forms, including actin filaments, microtubules, amyloid fibers, tobacco mosaic viruses, and bacteria flagella, and, because a 3D density map of a helical entity can be attained from a single projection image, compared to the many images required for 3D reconstruction of a non-helical object, with the IHRSR method, structural analysis of such flexible and disordered helical assemblies is now attainable. In this video article, we provide detailed protocols for obtaining a 3D density map of a helical protein assembly (HIV-1 capsid is our example), including protocols for cryo-EM specimen preparation, low dose data collection by cryo-EM, indexing of helical diffraction patterns, and image processing and 3D reconstruction using IHRSR. Compared to other techniques, cryo-EM offers optimal specimen preservation under near native conditions. Samples are embedded in a thin layer of vitreous ice, by rapid freezing, and imaged in electron microscopes at liquid nitrogen temperature, under low dose conditions to minimize the radiation damage. Sample images are obtained under near native conditions at the expense of low signal and low contrast in the recorded micrographs. Fortunately, the process of helical reconstruction has largely been automated, with the exception of indexing the helical diffraction pattern. Here, we describe an approach to index helical structure and determine helical symmetries (helical parameters) from digitized micrographs, an essential step for 3D helical reconstruction. Briefly, we obtain an initial 3D density map by applying the IHRSR method. This initial map is then iteratively refined by introducing constraints for the alignment parameters of each segment, thus controlling their degrees of freedom. Further improvement is achieved by correcting for the contrast transfer function (CTF) of the electron microscope (amplitude and phase correction) and by optimizing the helical symmetry of the assembly. Choose your favorite size: Peptide conjugates, BP-Ax-PEPAu, direct the synthesis and assembly of gold nanoparticles into well-defined hollow spherical gold nanoparticle superstructures. The diameter of the superstructures can be dialed-in by choosing the proper number of alanine residues, x: x = 2 leads to superstructures with diameters larger than 100 nm while x = 3 leads to superstructures with sub-50-nm diameters. © 2011 WILEY-VCH Verlag GmbH & Co. KGaA, Weinheim. The cullin4A-RING E3 ubiquitin ligase (CRL4) is a multisubunit protein complex, comprising cullin4A (CUL4), RING H2 finger protein (RBX1), and DNA damage-binding protein 1 (DDB1). Proteins that recruit specific targets to CRL4 for ubiquitination (ubiquitylation) bind the DDB1 adaptor protein via WD40 domains. Such CRL4 substrate recognition modules are DDB1- and CUL4-associated factors (DCAFs). Here we show that, for DCAF1, oligomerization of the protein and the CRL4 complex occurs via a short helical region (residues 845-873) N-terminal to DACF1's own WD40 domain. This sequence was previously designated as a LIS1 homology (LisH) motif. The oligomerization helix contains a stretch of four Leu residues, which appear to be essential for α-helical structure and oligomerization. In vitro reconstituted CRL4-DCAF1 complexes (CRL4(DCAF1)) form symmetric dimers as visualized by electron microscopy (EM), and dimeric CRL4(DCAF1) is a better E3 ligase for in vitro ubiquitination of the UNG2 substrate compared to a monomeric complex. TRIM proteins play important roles in the innate immune defense against retroviral infection, including human immunodeficiency virus type-1 (HIV-1). Rhesus macaque TRIM5α (TRIM5α(rh)) targets the HIV-1 capsid and blocks infection at an early post-entry stage, prior to reverse transcription. Studies have shown that binding of TRIM5α to the assembled capsid is essential for restriction and requires the coiled-coil and B30.2/SPRY domains, but the molecular mechanism of restriction is not fully understood. In this study, we investigated, by cryoEM combined with mutagenesis and chemical cross-linking, the direct interactions between HIV-1 capsid protein (CA) assemblies and purified TRIM5α(rh) containing coiled-coil and SPRY domains (CC-SPRY(rh)). Concentration-dependent binding of CC-SPRY(rh) to CA assemblies was observed, while under equivalent conditions the human protein did not bind. Importantly, CC-SPRY(rh), but not its human counterpart, disrupted CA tubes in a non-random fashion, releasing fragments of protofilaments consisting of CA hexamers without dissociation into monomers. Furthermore, such structural destruction was prevented by inter-hexamer crosslinking using P207C/T216C mutant CA with disulfide bonds at the CTD-CTD trimer interface of capsid assemblies, but not by intra-hexamer crosslinking via A14C/E45C at the NTD-NTD interface. The same disruption effect by TRIM5α(rh) on the inter-hexamer interfaces also occurred with purified intact HIV-1 cores. These results provide insights concerning how TRIM5α disrupts the virion core and demonstrate that structural damage of the viral capsid by TRIM5α is likely one of the important components of the mechanism of TRIM5α-mediated HIV-1 restriction. The capsid (CA) protein plays crucial roles in HIV infection and replication, essential to viral maturation. The absence of high-resolution structural data on unassembled CA hinders the development of antivirals effective in inhibiting assembly. Unlike enzymes that have targetable, functional substrate-binding sites, the CA does not have a known site that affects catalytic or other innate activity, which can be more readily targeted in drug development efforts. We report the crystal structure of the HIV-1 CA, revealing the domain organization in the context of the wild-type full-length (FL) unassembled CA. The FL CA adopts an antiparallel dimer configuration, exhibiting a domain organization sterically incompatible with capsid assembly. A small compound, generated in situ during crystallization, is bound tightly at a hinge site ("H site"), indicating that binding at this interdomain region stabilizes the ADP conformation. Electron microscopy studies on nascent crystals reveal both dimeric and hexameric lattices coexisting within a single condition, in agreement with the interconvertibility of oligomeric forms and supporting the feasibility of promoting assembly-incompetent dimeric states. Solution characterization in the presence of the H-site ligand shows predominantly unassembled dimeric CA, even under conditions that promote assembly. Our structure elucidation of the HIV-1 FL CA and characterization of a potential allosteric binding site provides three-dimensional views of an assembly-defective conformation, a state targeted in, and thus directly relevant to, inhibitor development. Based on our findings, we propose an unprecedented means of preventing CA assembly, by "conformationally trapping" CA in assembly-incompetent conformational states induced by H-site binding. Sub-100 nm hollow gold nanoparticle superstructures were prepared in a direct one-pot reaction. A gold-binding peptide conjugate, C(6)-AA-PEP(Au) (PEP(Au) = AYSSGAPPMPPF), was constructed and used to direct the simultaneous synthesis and assembly of gold nanoparticles. Transmission electron microscopy and electron tomography revealed that the superstructures are uniform and consist of monodisperse gold nanoparticles arranged into a spherical monolayer shell. Mature HIV-1 particles contain conical-shaped capsids that enclose the viral RNA genome and perform essential functions in the virus life cycle. Previous structural analysis of two- and three-dimensional arrays of the capsid protein (CA) hexamer revealed three interfaces. Here, we present a cryoEM study of a tubular assembly of CA and a high-resolution NMR structure of the CA C-terminal domain (CTD) dimer. In the solution dimer structure, the monomers exhibit different relative orientations compared to previous X-ray structures. The solution structure fits well into the EM density map, suggesting that the dimer interface is retained in the assembled CA. We also identified a CTD-CTD interface at the local three-fold axis in the cryoEM map and confirmed its functional importance by mutagenesis. In the tubular assembly, CA intermolecular interfaces vary slightly, accommodating the asymmetry present in tubes. This provides the necessary plasticity to allow for controlled virus capsid dis/assembly. Bacterial chemoreceptors undergo conformational changes in response to variations in the concentration of extracellular ligands. These changes in chemoreceptor structure initiate a series of signaling events that ultimately result in regulation of rotation of the flagellar motor. Here we have used cryo-electron tomography combined with 3D averaging to determine the in situ structure of chemoreceptor assemblies in Escherichia coli cells that have been engineered to overproduce the serine chemoreceptor Tsr. We demonstrate that chemoreceptors are organized as trimers of receptor dimers and display two distinct conformations that differ principally in arrangement of the HAMP domains within each trimer. Ligand binding and methylation alter the distribution of chemoreceptors between the two conformations, with serine binding favoring the "expanded" conformation and chemoreceptor methylation favoring the "compact" conformation. The distinct positions of chemoreceptor HAMP domains within the context of a trimeric unit are thus likely to represent important aspects of chemoreceptor structural changes relevant to chemotaxis signaling. Based on these results, we propose that the compact and expanded conformations represent the "kinase-on" and "kinase-off" states of chemoreceptor trimers, respectively. Left-handed gold nanoparticle double helices were prepared using a new method that allows simultaneous synthesis and assembly of discrete nanoparticles. This method involves coupling the processes of peptide self-assembly of and peptide-based biomineralization of nanoparticles. In this study, AYSSGAPPMPPF (PEPAu), an oligopeptide with an affinity for gold surfaces, was modified with an aliphatic tail to generate C12-PEPAu. In the presence of buffers and gold salts, amphiphilic C12-PEPAu was used to both control the formation of monodisperse gold nanoparticles and simultaneously direct their assembly into left-handed gold nanoparticle double helices. The gold nanoparticle double helices are highly regular, spatially complex, and they exemplify the utility of this methodology for rationally controlling the topology of nanoparticle superstructures and the stereochemical organization of discrete nanoparticles within these structures. Signal transduction in bacterial chemotaxis is initiated by the binding of extracellular ligands to a specialized family of methyl-accepting chemoreceptor proteins. Chemoreceptors cluster at distinct regions of the cell and form stable ternary complexes with the histidine autokinase CheA and the adapter protein CheW. Here we report the direct visualization and spatial organization of chemoreceptor arrays in intact Escherichia coli cells by using cryo-electron tomography and biochemical techniques. In wild-type cells, ternary complexes are arranged as an extended lattice, which may or may not be ordered, with significant variations in the size and specific location among cells in the same population. In the absence of CheA and CheW, chemoreceptors do not form observable clusters and are diffusely localized to the cell pole. At disproportionately high receptor levels, membrane invaginations containing nonfunctional, axially interacting receptor assemblies are formed. However, functional chemoreceptor arrays can be reestablished by increasing cellular levels of CheA and CheW. 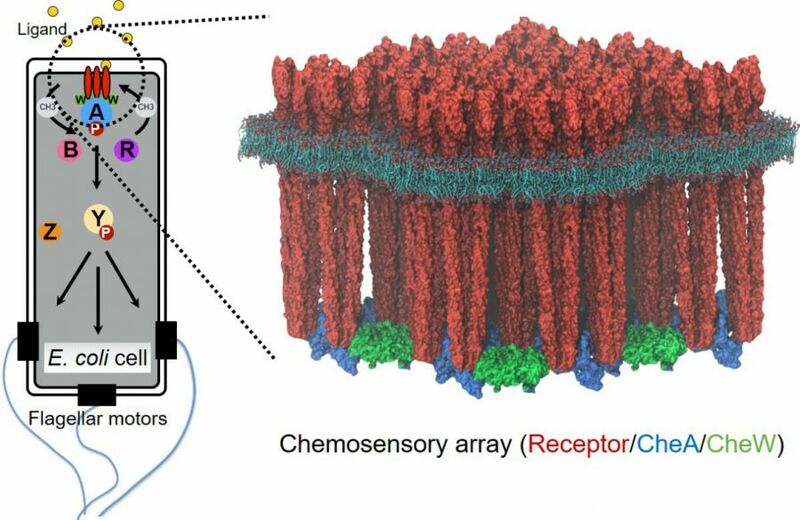 Our results demonstrate that chemotaxis in E. coli requires the presence of chemoreceptor arrays and that the formation of these arrays requires the scaffolding interactions of the signaling molecules CheA and CheW. Previous studies have shown that IRP1(+/-) IRP2(-/-) knockout mice develop progressive neurodegenerative symptoms similar to those observed in human movement disorders such as Parkinson's disease. Histological investigations using optical microscopy show that these IRP knockout mice display accumulation of ferritin in axonal tracts in the brain, suggesting a possible role for excess ferritin in mediating axonal degeneration. Direct observation of the 3D distribution of ferritin by electron tomography indicates that ferritin amounts are increased by 3- to 4-fold in selected regions of the brain, and structural damage is observed within the axon as evidenced by the loss of the internal network of filaments, and the invaginations of neighboring oligodendrocyte membranes into the axonal medium. While optical microscopic investigations suggest that there is a large increase in ferritin in the presumptive axonal regions of the IRP knockout mice, electron tomographic studies reveal that most of the excess ferritin is localized to double-walled vesicular compartments which are present in the interior of the axon and appear to represent invaginations of the oligodendrocyte cells into the axon. The amount of ferritin observed in the axonal space of the knockout mice is at least 10-fold less than the amount of ferritin observed in wild-type mouse axons. The surprising conclusion from our analysis, therefore, is that despite the overall increase in ferritin levels in the knockout mouse brain, ferritin is absent from axons of degenerating neurons, suggesting that trafficking is compromised in early stages of this type of neuronal degeneration. We have recently reported electron tomographic studies of sections obtained from chemically fixed E. coli cells overproducing the 60-kDa chemotaxis receptor Tsr. Membrane extracts from these cells prepared in the presence of Tween-80 display hexagonally close-packed microcrystalline assemblies of Tsr, with a repeating unit large enough to accommodate six Tsr molecules arranged as trimers of receptor dimers. Here, we report the direct visualization of the Tsr receptor clusters in (i) vitrified cell suspensions of cells overproducing Tsr, prepared by rapid plunge-freezing, and (ii) frozen-hydrated sections obtained from cells frozen under high pressure. The frozen-hydrated sections were generated by sectioning at -150 degrees C using a diamond knife with a 25 degrees knife angle, with nominal thicknesses ranging from 20 to 60 nm. There is excellent correspondence between the spatial arrangement of receptors in thin frozen-hydrated sections and the arrangements found in negatively stained membrane extracts and plunge-frozen cells, highlighting the potential of using frozen-hydrated sections for the study of macromolecular assemblies within cells under near-native conditions. Electron tomography is a powerful method for determining the three-dimensional structures of large macromolecular assemblies, such as cells, organelles, and multiprotein complexes, when crystallographic averaging methods are not applicable. Here we used electron tomographic imaging to determine the molecular architecture of Escherichia coli cells engineered to overproduce the bacterial chemotaxis receptor Tsr. Tomograms constructed from fixed, cryosectioned cells revealed that overproduction of Tsr led to formation of an extended internal membrane network composed of stacks and extended tubular structures. We present an interpretation of the tomogram in terms of the packing arrangement of Tsr using constraints derived from previous X-ray and electron-crystallographic studies of receptor clusters. Our results imply that the interaction between the cytoplasmic ends of Tsr is likely to stabilize the presence of the membrane networks in cells overproducing Tsr. We propose that membrane invaginations that are potentially capable of supporting axial interactions between receptor clusters in apposing membranes could also be present in wild-type E. coli and that such receptor aggregates could play an important role in signal transduction during bacterial chemotaxis. Strategies to achieve the highest resolutions in structures of protein complexes determined by cryo-electron microscopy generally involve averaging information from large numbers of individual molecular images. However, significant limitations are posed by heterogeneity in image quality and in protein conformation that are inherent to large data sets of images. Here, we demonstrate that the combination of iterative refinement and stringent molecular sorting is an effective method to obtain substantial improvements in map quality of the 1.8 MDa icosahedral catalytic core of the pyruvate dehydrogenase complex from Bacillus stearothermophilus. From a starting set of 42,945 images of the core complex, we show that using only the best 139 particles in the data set produces a map that is superior to those constructed with greater numbers of images, and that the location of many of the alpha-helices in the structure can be unambiguously visualized in a map constructed from as few as 9 particles. The GTPase dynamin is essential for numerous vesiculation events including clathrin-mediated endocytosis. Upon GTP hydrolysis, dynamin constricts a lipid bilayer. Previously, a three-dimensional structure of mutant dynamin in the constricted state was determined by helical reconstruction methods. We solved the nonconstricted state by a single-particle approach and show that the stalk region of dynamin undergoes a large conformational change that drives tube constriction. We have previously reported the development of AutoEM, a software package for semi-automated acquisition of data from a transmission electron microscope. In continuing efforts to improve the speed of structure determination of macromolecular assemblies by electron microscopy, we report here on the performance of a new generation of 4 K CCD cameras for use in cryo electron microscopic applications. We demonstrate that at 120 kV, and at a nominal magnification of 67000 x, power spectra and signal-to-noise ratios for the new 4 K CCD camera are comparable to values obtained for film images scanned using a Zeiss scanner to resolutions as high as approximately 1/6.5A(-1). The specimen area imaged for each exposure on the 4 K CCD is about one-third of the area that can be recorded with a similar exposure on film. The CCD camera also serves the purpose of recording images at low magnification from the center of the hole to measure the thickness of vitrified ice in the hole. The performance of the camera is satisfactory under the low-dose conditions used in cryo electron microscopy, as demonstrated here by the determination of a three-dimensional map at 15 A for the catalytic core of the 1.8 MDa Bacillus stearothermophilus icosahedral pyruvate dehydrogenase complex, and its comparison with the previously reported atomic model for this complex obtained by X-ray crystallography. Members of the dynamin family of GTPases have unique structural properties that might reveal a general mechanochemical basis for membrane constriction. Receptor-mediated endocytosis, caveolae internalization and certain trafficking events in the Golgi all require dynamin for vesiculation. The dynamin-related protein Drp1 (Dlp1) has been implicated in mitochondria fission and a plant dynamin-like protein phragmoplastin is involved in the vesicular events leading to cell wall formation. A common theme among these proteins is their ability to self-assemble into spirals and their localization to areas of membrane fission. Here we present the first three-dimensional structure of dynamin at a resolution of approximately 20 A, determined from cryo-electron micrographs of tubular crystals in the constricted state. The map reveals a T-shaped dimer consisting of three prominent densities: leg, stalk and head. The structure suggests that the dense stalk and head regions rearrange when GTP is added, a rearrangement that generates a force on the underlying lipid bilayer and thereby leads to membrane constriction. These results indicate that dynamin is a force-generating 'contrictase'. In high-resolution biological electron microscopy, the speed of collection of large numbers of high-quality micrographs is a rate-limiting step in the overall process of structure determination. Approaches to speed up data collection can be very useful, especially in "single-molecule" microscopy of large multiprotein and protein-nucleic acid complexes, where many thousands of individual molecular images need to be averaged to determine the three-dimensional structure. Toward this end, we report the development of automated low-dose image acquisition procedures on a Tecnai 12 electron microscope using the scripting functionality available on the microscope computer. At the lowest level of automation, the user is required to select regions of interest that are to be imaged. All subsequent steps of image acquisition are then carried out automatically to record high-resolution images on either film or CCD, at desired defocus values, under conditions that satisfy user-specified limits for drift rates of the specimen stage. At the highest level of automation, determination of the best grid squares and the best regions suitable for imaging are carried out automatically. A medium level of automation is also available in which the user can designate the most promising grid squares manually and leave the process of finding the best holes in those grid squares to the microscope computer. We also show that all steps subsequent to insertion of the specimen in the microscope can be carried out remotely by connecting to the microscope computer via the Internet. Both features are implemented using Windows NT and Web-based tools and provide tools for automated data collection on any Tecnai microscope from any location. Thapsigargin (TG) is a potent inhibitor of Ca(2+)-ATPase from sarcoplasmic and endoplasmic reticula. Previous enzymatic studies have concluded that Ca(2+)-ATPase is locked in a dead-end complex upon binding TG with an affinity of <1 nM and that this complex closely resembles the E(2) enzymatic state. We have studied the structural effects of TG binding by cryoelectron microscopy of tubular crystals, which have previously been shown to comprise Ca(2+)-ATPase molecules in the E(2) conformation. In particular, we have compared 3D reconstructions of Ca(2+)-ATPase in the absence and presence of either TG or its dansylated derivative. The overall molecular shape of Ca(2+)-ATPase in the reconstructions is very similar, demonstrating that the TG/Ca(2+)-ATPase complex does indeed physically resemble the E(2) conformation, in contrast to massive domain movements that appear to be induced by Ca(2+) binding. Difference maps reveal a consistent difference on the lumenal side of the membrane, which we conclude corresponds to the thapsigargin-binding site. Modeling the atomic structure for Ca(2+)-ATPase into our density maps reveals that this binding site is composed of the loops between transmembrane segments M3/M4 and M7/M8. Indirect effects are proposed to explain the effects of the S3 stalk segment on thapsigargin affinity as well as thapsigargin-induced changes in ATP affinity. Indeed, a second difference density was observed at the decavanadate-binding site within the three cytoplasmic domains, which we believe reflects an altered affinity as a result of the long-range conformational coupling that drives the reaction cycle of this family of ATP-dependent ion pumps. BACKGROUND: Structures have recently been solved at 8 A resolution for both Ca2+-ATPase from rabbit sarcoplasmic reticulum and H+-ATPase from Neurospora crassa. These cation pumps are two distantly related members of the family of P-type ATPases, which are thought to use similar mechanisms to generate ATP-dependent ion gradients across a variety of cellular membranes. We have undertaken a detailed comparison of the two structures in order to describe their similarities and differences as they bear on their mechanism of active transport. RESULTS: Our first important finding was that the arrangement of 10 transmembrane helices was remarkably similar in the two molecules. This structural homology strongly supports the notion that these pumps use the same basic mechanism to transport their respective ions. Despite this similarity in the membrane-spanning region, the cytoplasmic regions of the two molecules were very different, both in their disposition relative to the membrane and in the juxtaposition of their various subdomains. CONCLUSIONS: On the basis of the crystallization conditions, we propose that these two crystal structures represent different intermediates in the transport cycle, distinguished by whether cations are bound to their transport sites. Furthermore, we propose that the corresponding conformational change (E2 to E1 ) has two components: the first is an inclination of the main cytoplasmic mass by 20 degrees relative to the membrane-spanning domain; the second is a rearrangement of the domains comprising the cytoplasmic part of the molecules. Accordingly, we present a rough model for this important conformational change, which relays the effects of cation binding within the membrane-spanning domain to the nucleotide-binding site, thus initiating the transport cycle. Stokes DL, Zhang P, Toyoshima C, Yonekura K, Ogawa H, Lewis MR, Shi D.	1998. Cryoelectron microscopy of the calcium pump from sarcoplasmic reticulum: two crystal forms reveal two different conformations. Acta Physiol Scand Suppl,	643	(643),	pp. 35-43. The calcium pump from sarcoplasmic reticulum (Ca2+-ATPase) is typical of the large family of P-type cation pumps. These couple ATP hydrolysis with cation transport, generating cation gradients across membranes. Ca2+-ATPase specifically maintains the low cytoplasmic calcium concentration of resting muscle by pumping calcium into the sarcoplasmic reticulum; subsequent release is used to initiate contraction. No high-resolution structure of a P-type pump has yet been determined, although a 14-A structure of Ca2+-ATPase, obtained by electron microscopy of frozen-hydrated, tubular crystals, showed a large cytoplasmic head connected to the transmembrane domain by a narrow stalk. We have now improved the resolution to 8A and can discern ten transmembrane alpha-helices, four of which continue into the stalk On the basis of constraints from transmembrane topology, site-directed mutagenesis and disulphide crosslinking, we have made tentative assignments for these alpha-helices within the amino-acid sequence. A distinct cavity leads to the putative calcium-binding site, providing a plausible path for calcium release to the lumen of the sarcoplasmic reticulum. The A2a adenosine receptor agonist 2(-)[2-(4-amino-3- iodophenyl)ethylamino]adenosine is a potent coronary vasodilator. The corresponding radioiodinated ligand, [125I]APE, discriminates between high- and low-affinity conformations of A2a adenosine receptors. In this study, [125I]APE was used for rapid (24-h) autoradiography in rat brain sections. The pattern of [125I]APE binding is consistent with that expected of an A2a-selective radioligand. It is highest in striatum, nucleus accumbens, and olfactory tubercle, with little binding to cortex and septal nuclei. Specific [125I]APE binding to these brain regions is abolished by 1 microM 2-p-(2-carboxyethyl)phenethylamino-5'-N-ethylcarboxamidoadenosine (CGS-21680) but is little affected by 100 nM 8-cyclopentyl-1,3-dipropylxanthine. Conversion of [125I]APE to the corresponding arylazide results in [125I]AzPE. The rank-order potency of compounds to compete for [125I]AzPE binding in the dark is CGS-21680 > D-(R)-N6-phenylisopropyladenosine > N6- cyclopentyladenosine, indicating that it also is an A2a-selective ligand. Specific photoaffinity labeling by [125I]AzPE of a single polypeptide (42 kDa) corresponding to A2a adenosine receptors is reduced 55 +/- 4% by 100 microM guanosine 5'-O-(3-thiotriphosphate) and 91 +/- 1.3% by 100 nM CGS-21680. [125I]APE and [125I]AzPE are valuable new tools for characterizing A2a adenosine receptors and their coupling to GTP-binding proteins by autoradiography and photoaffinity labeling.